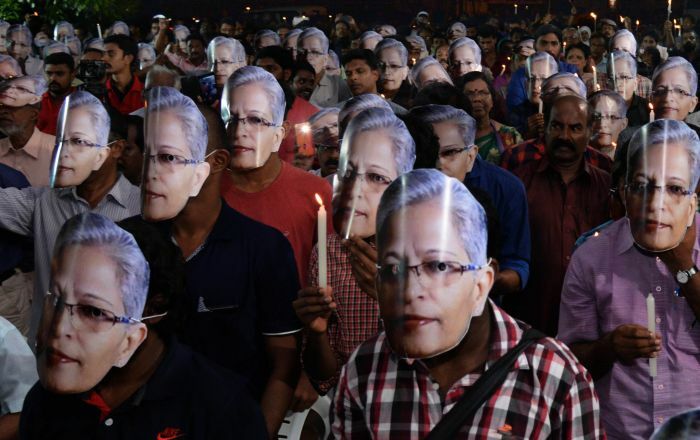 Three accused in journalist Gauri Lankesh murder case were conspirators in the Narendra Dabholkar murder too, and one of them imparted weapon-training to Dabholkar's shooters, the Central Bureau of Investigtion told a court in Pune on Saturday. The CBI arrested Sachin Andure, one of the alleged shooters of Dabholkar, last month. The agency on Saturday produced Rajesh Bangera and Amit Digvekar, both accused in the Lankesh murder case, along with Andure in the Pune court. Andure's CBI remand ended on Saturday. The court sent Digvekar and Bangera in CBI custody till September 10, while Andure was sent in judicial custody. Claiming that there was a link between the accused in the two cases, the CBI on Friday took the custody of Bangera and Digvekar from the Karnataka Special Investigation Team which is probing the Lankesh murder. "Bangera, a government employee and PA to a Congress MLC in Karnataka, gave weapon-training to both the shooters, Andure and (Sharad) Kalaskar, who killed Dr Dabholkar," CBI lawyer Vijaykumar Dhakane told the court in Pune. Bangera was also involved in the conspiracy of Dr Dabholkar's murder, and CBI needs to interrogate him to find out where he imparted training, the source of fire arms, and 'present whereabouts of the fire arms', the prosecutor said. As to Digvekar, the CBI lawyer said he had helped Andure to do a reconnaissance of Dabholkar's house and the routes that the anti-superstition activist usually took. "Digvekar lived in a Goa-based Ashram for over 15 years and was associated with Dr Virendra Tawde, one of the key conspirators in Dabholkar case. Digvekar is one of the co-conspirators in Dabholkar murder case as entire conspiracy was hatched by Dr Tawde along with Digvekar and this conspiracy needs to be unearthed," said the CBI lawyer. Defence lawyer Samir Patwardhan pointed out from the CBI's charge sheet against Tawde that the agency had earlier claimed that Sarang Akolkar and Vinay Pawar had shot Dabholkar, and now it has come out with a different version. After hearing both the sides, Judicial Magistrate (First Class) R R Bhalgat remanded Bangera and Digvekar in CBI custody till September 10 and sent Andure in judicial remand. The CBI could not take the custody of Amol Kale, a third accused in Lankesh case who it says is one of the main conspirators in Dabholkar case too, due to some technicalities, its lawyer said. Sharad Kalaskar, the second alleged shooter who fired on Dabholkar, is in the custody of Maharashtra Anti-Terrorism Squad in an explosives seizure case. Dabholkar was shot dead in Pune on August 20, 2013, while Gauri Lankesh was murdered in Bengaluru on September 5, 2017.